Do you, like Pope John Paul the Second and Prince Charles, regard Descartes as a subjectivist? Or Rousseau as someone who believed that humans in the state of nature would treat each other nicely? Do you believe that Hobbes was an atheist? Or that the history of philosophy leading up to Kant can be divided into empiricists and rationalists? Well, then you are wrong. Nietzsche says somewhere that philosophers are incompetent when it comes to tending to philosophy as a subject, since philosophers perennially seek to de-historicize everything and see philosophical thought as floating in a free realm outside of time and space. Nietzsche was right about this. Philosophers are notoriously afraid of historicizing philosophy. I once had a discussion with a guy who loved Sartre’s Being and Nothingness. In his opinion, people who found broad swatches of that book incomprehensible had simply failed to reflect deeply on its contents. When I rejoined that Sartre had written the work during a period when he popped as many as 20 amphetamine pills a day, and that several passages are in fact meaningless according to Sartre, my interlocutor replied that historical details like that are not relevant to philosophy. That was a typical example of the tendency that Nietzsche was lambasting. Philosophers tend to believe that philosophical thought is so elevated that it stands outside of the conditions of history. In reality, all this approach means is that the whole field of philosophy ends up reproducing the same amateurish historiography, littered with distortions which in many cases were actually the work of partisan writers, meant to glorify their favorite philosopher at the expense of his rivals. Real historians would laugh at the so-called historical method that prevails in philosophy. 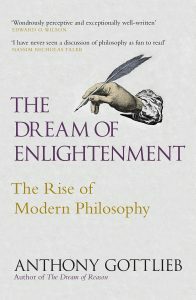 So wouldn’t it be nice with a book that sought to re-historize philosophy? To look at the field afresh, as it were? 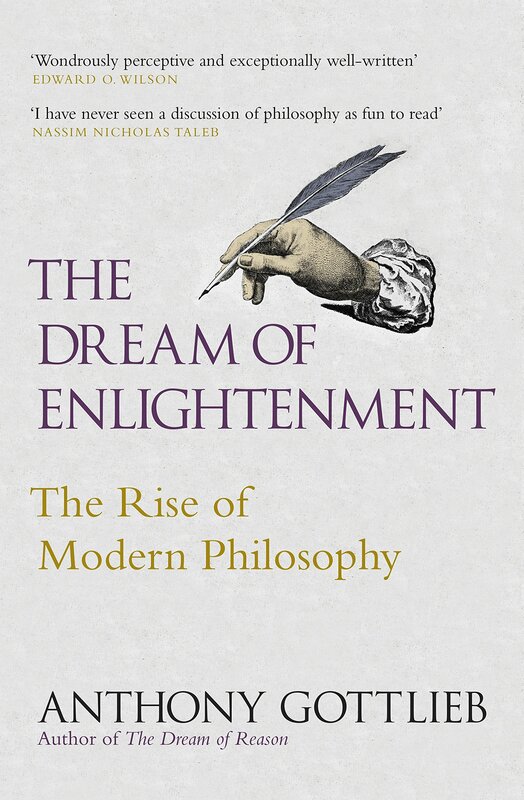 Well, that book exists – it’s Anthony Gottlieb’s The Dream of Enlightenment, which was published last year. Descartes wasn’t particularly interested in whether the world really exists. He merely wanted to get some preliminary methodical considerations out of the way before proceeding with the thrust of his project, which consisted of anatomical studies of carcasses, the findings from which he creatively used to argue that bodies are like biological machines. He is regarded as the father of modern philosophy, but in reality his project had far more in common with the naturalistic spirit of the Greeks than with any of the philosophers who succeeded him. Spinoza was not the noble loner who consoled himself by devising of his high-minded philosophy in solitude. In the Marrano-Jewish community from which he was excommunicated, at least two other members had previously gotten themselves into trouble by presenting God, not as a supernatural anthropomorphic being, but as an entirely natural rational principle, animating the whole of the cosmos. Nor was he impoverished – in fact, he lived quite comfortably from the money his fans and friends continually sent him. You might say he had his own Patreon thing going. Hume did not regard the problem of induction as something to get hung up on. In his opinion, this limitation was simply an a priori condition of all cognition; a reminder of how fragile human knowledge is and always will be. He would have laughed at the Herculean efforts some of the 20th century’s greatest philosophers undertook to solve it – in vain, one might add. One thing that is tiring about the book is that the author expends considerable resources kicking a downed enemy with snide points about how unflatteringly the church acted in the face of these new philosophies, and how busy the people of the cross were with limiting free thought and free speech in Europe. To be sure, the gradual liberation from the intellectual stranglehold of the church is an important part of the history of the enlightenment. But the basic opposition between church and free thought is clear after the first batch of observations have been furnished to this point. Double-digit variations end up becoming their own pious zeal. Another minus is that the book is patchy and random about which of its themes it develops over several pages, and which are merely outlined in a sentence or two. Nonetheless, the book is original and absolutely worth reading. There can be no denying that Gottlieb writes about philosophy in a comical, coy, and crystal clear way which supersedes Bertrand Russell in several places. The book’s main point, namely that philosophy cannot be separated from the historical conditions in which it was spawned, is a cogent one, and after turning the last page it is evident that many of the things usually said about the West’s greatest geniuses are distorted, wrong, or both. The history of philosophy is as much mythology as it is history. It has assumed a life of its own and many philosophers would hardly recognize themselves in the standard histories of the field. It is also instructive to see how first-rate minds either aligned themselves with the intellectual fashions of the day or were consigned to sideshows as ‘minor philosophers.’ No matter how smart you are, it is hard to escape the spirit of the times. Harder still is to be noticed and taken seriously if your thought does not fit the current trends. In the end, one could ask: If philosophy is presumably able to stand outside of time and space, why is it then that 90% of the most important advances in Western philosophy originated from just two places and were concentrated over two small periods, with a duration of less than half a millennium in total (that is to say, Greece in classical times and Northern Europe in the early modern period)? That this astounding coincidence should somehow have nothing to do with the terms imposed on thought by history is, it seems, something one would need to take 20 amphetamine pills a day to comprehend. I have a question! If I want someone to professionally type me (say through a skype interview) and I had the ability to pay for the services. Who could I email or talk to for this? I have been studying Jungian functions for quite some time now but cannot, for the life of me, figure out my type!